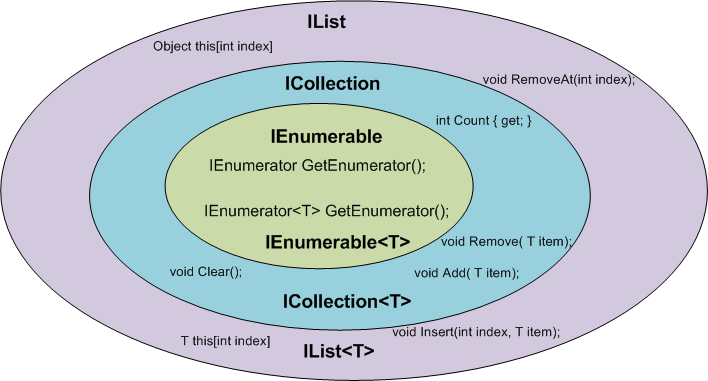 I think that the question when to use IEnumerable, ICollection, IList or List is a common one that hasn’t often being answered in an easy way. I not only want to do this within this article, but I also want to give you some further information to understand the things more deeply. If you get the understanding for the principle, you’ll be automatically really confident when you have to do this decision for the next time. If you only want to know when to use which type, scroll down and have a look at the table providing the scenarios and the relevant types. I strongly recommend reading of the entire article to get a deeper understanding. Let’s first take a look at the individual types and more importantly its members. It’s generally a good idea to have a look at the types in question if you want to decide which type you should use in a specific situation in your code. First of all, it is important to understand, that there are two different interfaces defined in the .NET base class library. There is a non-generic IEnumerable interface and there is a generic type-safe IEnumerable<T> interface. The GetEnumerator method must return an instance of an object of a class which implements the IEnumerator interface. We won’t have a look at the definition of the IEnumerator interface this time, but if you are interested, please visit the official msdn documentation. It is important to know that the C# language foreach keyword works with all types that implement the IEnumerable interface. Only in C# it also works with things that don’t explicitly implement IEnumerable or IEnumerable<T>. I believe you have been using the foreach keyword many times and without worrying about the reason why and how it worked with that type. As you can see the IEnumerable<T> interface inherits from the IEnumerable interface. Therefore a type which implements IEnumerable<T> has also to implement the members of IEnumerable. IEnumerable<T> defines a single method GetEnumerator which returns an instance of an object that implements the IEnumerator<T> interface. We won’t have a look at this interface this time. Please take a look at the official msdn documentation if you would like to get some more information. As you can imagine, there are also two versions of ICollection which are System.Collections.ICollection and the generic version System.Collections.Generic.ICollection<T>. ICollection inherits from IEnumerable. You therefore have all members from the IEnumerable interface implemented in all classes that implement the ICollection interface. In fact, we have some more methods to add, remove and clear a collection. The way synchronization was implemented differs also. I believe that this happened because the generic version of this interface was introduced with .NET 2.0 whereas the non-generic version was already introduced in .NET 1.1. As we mentioned before when discussing the ICollection<T> interface, there are some more methods defined in the ICollection<T> interface than in the ICollection interface. Therefore the member list of the IList<T> interface is a bit shorter than the non-generic equivalent. We only have some new methods for accessing a collection with specific positioning. Take a look at the following graphic. Not every interface member is displayed, but it should be enough to give you an overview about all types we discussed. Which type should you depend on? Now that we have looked at all of the interfaces in question, we are ready to decide which interface we should depend on in a certain situation. Generally, it’s a great idea to depend only on things we really need. I am going to show you how this decision can be made very easily and what you can expect to gain if you do so. If you use a narrower interface type such as IEnumerable instead of IList, you protect your code against breaking changes. If you use IEnumerable, the caller of your method can provide any object which implements the IEnumerable interface. These are nearly all collection types of the base class library and in addition many custom defined types. The caller code can be changed in the future and your code won’t break that easily as it would if you had used ICollection or even worse IList. If you use a wider interface type such as IList, you are more in danger of breaking code changes. If someone wants to call your method with a custom defined object which only implements IEnumerable, it simply won’t work and will result in a compilation error. Generally you should always use that type that provides a contract for only the methods you really use. The following table gives you an overview of how you can decide which type you should depend on. IEnumerable, IEnumerable<T> The only thing you want is to iterate over the elements in a collection. You only need read-only access to that collection. List, List<T> Since in object oriented design you want to depend on abstractions instead of implementations, you should never have a member of your own implementations with the concrete type List/List. If you are now curious about interfaces, how they work, how to implement them by your own and how their use can improve your design and therefore the quality of your entire code base, I highly recommend watching C# Interfaces by Jeremy Clark on Pluralsight. He manages to explain several really important concepts in a very easily understandable way.